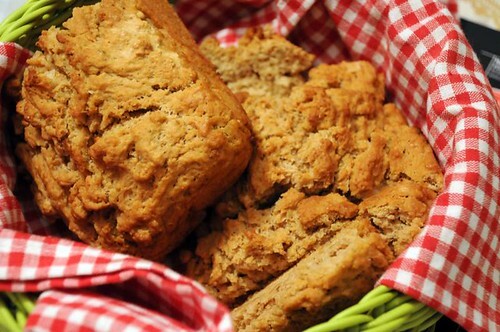 This bread is so fantastic - it takes no time at all, since it's made with baking powder rather than yeast, and it's great to serve alongside a soup or a stew. You can vary the spices as you wish, and the recipe can be doubled. I used a flavorful porter beer, and I can really recommend that - but try it with any beer, I'm sure it'll be just as good. I used a small loaf tin, but I might try muffin tins next time. Butter a small loaf tin and preheat the oven to 175°C. Mix flour, baking powder, sugar, salt, oregano and thyme. Add the porter and mix lightly. It'll be a very thick batter. Pour it into the loaf tin, and top the whole thing with the melted butter. Bake for about 30 minutes. Serve right away. I tried this tonight. Good stuff! The 2 of us ate it all up with our soup. Thanks, Anne!